Newly-published research suggests that most of us have a fairly good chance of correctly picking a Charlotte out in a line-up of strangers due to name “stereotypes”, and that we may actually grow to look more like our names! The results of the research were published in the Journal of Personality and Social Psychology on Monday and they’re pretty fascinating, especially if you’re in the process of naming your very own little human. “Research demonstrates that facial appearance affects social perceptions. The current research investigates the reverse possibility: Can social perceptions influence facial appearance?” Write the study’s authors. say the study authors began in their name and face focused study. In other words, they wanted to find out if people BECAME a stereotypical version of their name – and delved into people’s response and recognition of names generally, too. Matching names to faces via stereotyping was a big focus of the work. 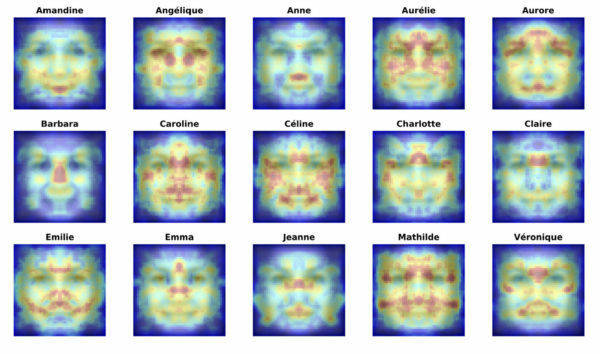 The researchers found that when people were shown a stranger’s face and given a choice of five names, they were able to choose that stranger’s name about 35 percent of the time. This is above and beyond the random chance of 20 percent, apparently. Researchers also delved into Artificial Intelligence (AI) too, creating a computerised algorithm that studied faces and names – and running thousands of faces through the system to inform their research. Scans of the facial features of people were classified by name and there were definite similarities in those that shared a moniker. “You can see it’s the places with different expressions or most of our expressions,” research lead author Yonat Zwebner told NPR. Much more research needs to be done into these name-face recognition patterns, but Yonat suggests it’s possible that people adapt their facial muscles to suit their names as they grow up. He thinks that there are stereotypes attached to names that may influence our behaviour – and encourage us to look “more like” our name. While other researchers not connected to the study feel that factors such as culture and name popularity may be skewing these results, they believe that Dr Zwebner may be onto something, too! We can’t wait to hear more about this interesting idea. Do you think YOU look like your name? And how would you even know? !